The FX market is no stranger to volatility. Whether it is global economic or political uncertainties, or a country’s interest rate outlook, they all play out in the currency markets. The constant push and pull of both known and unknown information can lead to bouts of extreme volatility. FX traders love volatility. 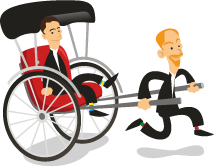 There are plenty of opportunities to enter and exit positions and make money. FX trading is not for the faint hearted however, it is easier to lose money than it is to make it. But how do businesses that are buying or selling goods and services in foreign currencies navigate their way through the challenges of managing FX risk? FX trading is not a core function for most businesses but yet the impact of the FX market can make or break a financial year. I have witnessed businesses being wiped out due to adverse FX movements such as the commodity exporter that saw commodity prices plummet at the same time as the FX rate soar, a catastrophic combination. On the other hand I have seen a business live to trade another year because it was sitting on significant gains from in-the-money FX hedges that were cashed up to offset the losses suffered in the core business. There is a plethora of risk management approaches to FX risk. To start with there is the philosophical debate about whether to hedge or not. Some would say that it is a zero-sum game in the long run i.e. periods of currency strength will be offset by periods of weakness, therefore, there is no incentive to hedge, just live with the swings and roundabouts of the prevailing spot rate. Of course the question is whether a business can sustain periods of adverse currency movements long enough to stay in business and enjoy the good times. For those that do participate in FX hedging there are questions of how much to hedge, when to hedge, which financial instrument to use? The NZD/AUD exchange rate in the last few months has demonstrated massive volatility strengthening 10c (>10%) in less than six months. For years the NZD was extremely weak against the high flying AUD. As every other economy was cutting interest rates following the GFC the Aussies were just digging up more of its natural resources and selling it to China. The global recession did not come to Australia. More recently there has been a significant change in the Australian economic outlook. Current account surplus has turned to deficit as its trading partners have slowed, forcing the Reserve Bank to loosen monetary policy. At the same time the better performing NZ economy has been able to sustain a removal of the post-recession super loose monetary policy conditions. 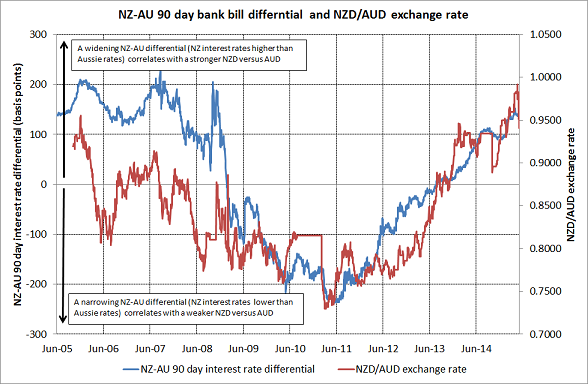 As shown below the interest rate differential of NZ and Australia remains a clear influence on the exchange rate. The importance of the Australian economy to New Zealand means that there are a lot of NZ companies exporting to Australia that are having to manage the NZD/AUD exchange rate. Everyone has a view – some you pay for (treasury advisors, consultants) some you don’t (bankers, taxi drivers) but they all have one thing in common – nobody knows the future direction of FX rates. That’s not to say taking advice (paid for or otherwise) is not relevant. No advice will be right all of the time but so long as the view is well considered and relevant to your business then it is hard to be critical after the fact with the benefit of hindsight. Hedging buys a business the necessary time to adjust selling prices or supply contracts to the new FX level. A fundamental aspect of FX hedging decisions is to quantify and understand the impact of FX movements on the business. By regularly making and updating foreign cashflow forecasts, capturing existing hedging in place and understanding the impact of FX movements on the unhedged component of foreign cashflows, a company is in a much better position to make informed hedging decisions. Whether it is a budget rate or a costing rate to protect knowing your position is essential for making better FX hedging decisions. One thing is certain – FX markets will always be volatile – the question is whether a company has enough visibility on its current position to make sound decisions about the future. Hedgebook is a tool that can help give a company the visibility it needs to make informed FX hedging decisions.